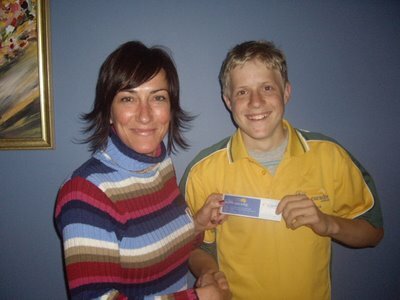 For Example – just last October, when he was 15, he cycled across Australia for charity with his dad – 4,500 kms in 30 days. Jack’s the youngest person ever to cycle across Australia and it’s a great effort when you consider he cycled up to 260 kms a day into howling headwinds and stifling heat. He raised a ton of money for Big Brothers Big Sisters of Australia. He’s also just run the 2009 Gold Coast Marathon and finished the Kokoda Challenge – a 96 km bushwalk on the Gold Coast (he did both of those with his 15 yo brother Harry). To top that all off, he’s also training to get his pilot’s licence and often comes into land with massive passenger jets right behind him at Gold Coast Airport.